The hallway is the first place you see when you open the door to your home. A good spring clean will have it freshened up, sparkling clean and looking welcoming in no time at all. Nobody wants to come home to piles of shoes, bags and junk littering the entrance way. Our spring cleaning checklist will get you through the clean up quickly and efficiently. I do prefer the more natural cleaning products where possible, especially in family homes. They also tend to smell much nicer. Again you’ll need to set aside either a morning or an afternoon to give the hall a good spring clean. As always when spring cleaning, get the windows open wide and the music loud. Makes it so much better. surface cleaner – I like Method Multi-Surface Cleaner in French Lavender it smells divine and you can clean most surfaces with it. window cleaner – you can make your own natural window cleaner this leaves glass streak free. specialist cleaners like beeswax polish for wood. Take down light fittings, clean and return. Dust cornice and ceiling features, use a long handled feather duster to do this and to knock down any dusty cobwebs that might be hanging about. Windows – vacuum and wipe down blinds, vacuum window vents, wash the windows, I use the natural homemade window cleaner for this job. Finally clean the windowsills. Cupboards – if you’re lucky enough to have space in the hall for cupboards. Get out all the contents, go through them and sort out what is still wanted. Throw/give away or sell any unwanted items. Clean the inside and outside of the cupboards and put back all the things that you are keeping. Arrange them so that frequently used items are easy to access. Declutter and clean all surfaces. Clean light switches and door handles – I do this with a slightly damp cloth which I’ve soaked in hot soapy water with a couple of drops of tea tree oil. Make sure you wring out the cloth really really well. Don’t go dripping water into electrics! Vacuum the light shades and clean lamp bases. Clean the mirrors – I do this with the homemade window cleaner. Clean all the ornaments – any that can be washed in warm soapy water then do so. Vacuum behind and under all the furniture. Vacuum and wipe down all the woodwork – bannisters, spindles, door frames and skirting boards. Vacuum/dryclean/steam clean (as per instructions) any carpets and rugs. Get the Daisies & Pie printable spring clean the hallway checklist. It’s a great idea to have clutter baskets and charity bags to keep on top of day to day clutter. Try to make sure all your belongings have a place where they’re kept, it makes tidying up so much easier. 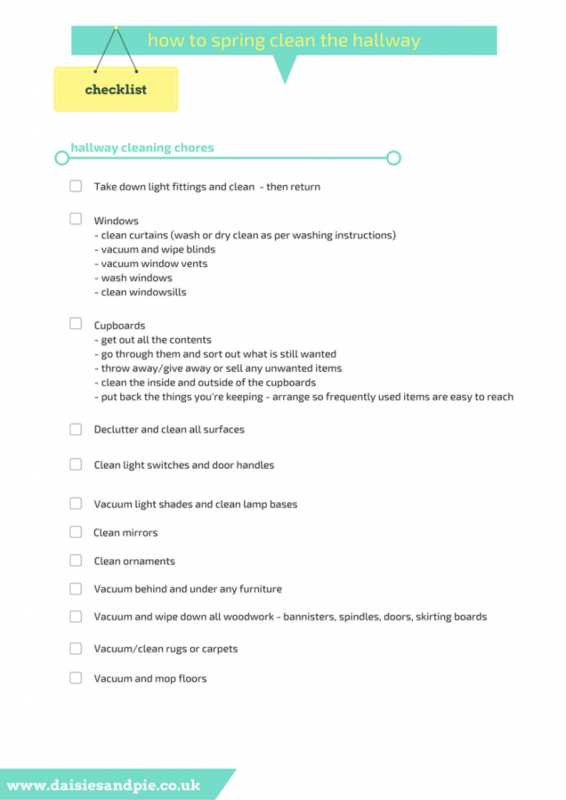 And once you’ve got things clean and organised try out our Easy Housework Routine to keep on top of things. It breaks down housework into manageable daily, weekly and monthly tasks.